Keep it level from your seat! All-in-one RV level provides visual side-to-side and front-to-rear leveling assistance for trailers, 5th wheels and motorhomes. 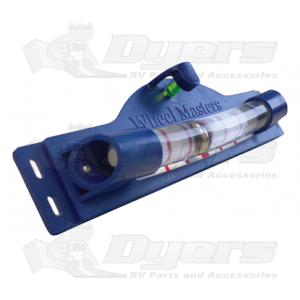 This huge level, 10 3/4" x 2-7/8" all-in-one RV level provides visual leveling from the driver’s seat, giving improved visibility with vivid color bars. It offers horizontal and vertical leveling so you’ll always be square. The leveling bars are encased in UV-resistant plastic — no leaking or rusting sometimes associated with other levels! Each mark on the side-to-side scale indicates one inch of blocking. This level is easy to install on your trailer or motorhome and is adaptable for a 5th wheel with the 6700BK bracket. This level comes with easy-to-install instructions.